How do designers understand the intangible qualities of place? How can drawing, both in-situ and remotely, allow placemakers to come to terms with layered realities of a place? How does place factor into arguments for resilience? This survey addresses these three questions by drawing from well established place theorists, authors on representation, design process, and creativity, and contributors to concepts of land ethics and sustainability. 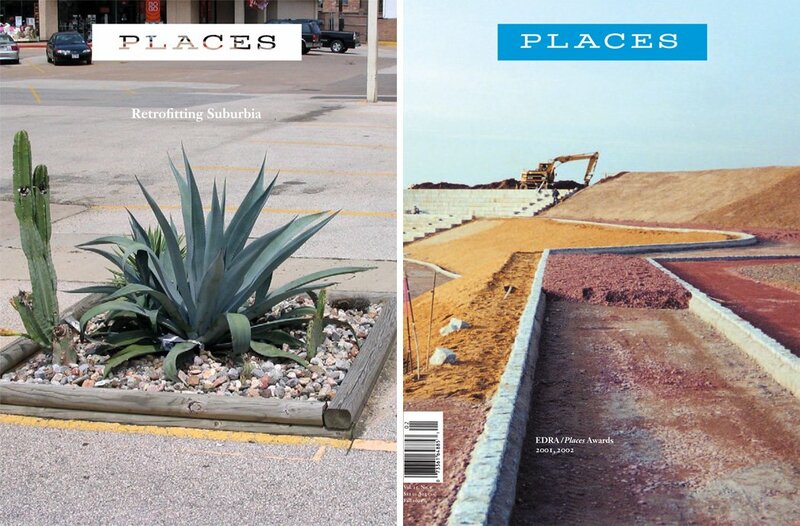 Our intent is to provide readers with an overview of influential place theories, present some graphic methods for exploring the multivalent realities of a place, and conclude by asserting that place – and by extension, drawing place – has an important role in resilience and sustainability dialogues. Our bibliography barely scratches the surface of these topics, but rather provides an introduction to key themes and authors that serves as a springboard for those wishing to dig deeper into understanding and drawing place. Place is closely related to the construct of space, but the two concepts are, in fact, quite different (Relph 1976). Whereas space is understood as the physical, material environment, place is more closely related to how people perceive, remember, and feel. While space is quantifiable, dimensional, and objective, place can only exist as occupied territory. As an amalgam of space, experience, and memory, place cannot exist outside the sentient and sensorial presence of people. Most of the information we gather about places is retrieved through our senses: collected in the here and now, recalled in memory, or a combination of the two. Nevertheless, for decades, land development has arguably been more strongly influenced by objective data-driven approaches such as the McHargian process (Farr 2008). While it is undeniably vital to understand the spatial complexities of cities and landscape, the abstract nature of data and spatial (plan) delineation is far removed from a sensory experience of place. The features that make a place a “place” must be understood and documented through direct contact and observation (Crowe and Laseau 1984). In his work on place, Christian Norberg-Schulz returns to the above point about it being a characterful amalgam of physical space, experienced phenomena, and a perceived “spirit of place” (1980). In describing the character of a landscape, Norberg-Schulz suggests a litmus test of language: can the landscape be considered and communicated through nouns, prepositions, and adjectives? If not, one is unlikely to have gained a full understanding of the land. In this context, layers of data or even maps in the traditional cartographic sense – with their primary reliance on nouns and prepositions and only a limited palette of adjectives – may be inadequate. Landscape character and visual assessment began in the United States before translating over the Atlantic and into European planning practice in the mid-1980s, cementing the interconnectivity of physical landscape attributes, quality of landscape experience, and the value of place within a legislative framework (Preece 1991). The environmental design disciplines have developed and drawn on other fields’ methods to imbue their understanding of the landscape with qualities beyond those supported by macro-scale mapping and scientific surveys. In a sense, these approaches move the understanding of landscapes and cities toward place rather than space. A movement away from space understanding to place understanding occurs through, among other things, phenomenological documentation through field sketching and notes (Crowe and Laseau 1984); community engagement (Hester 1984); imageability and cognitive mapping (Lynch 1960); serial visioning (Cullen 1961; Bosselmann 1998); and eidetic photomontage (Belanger and Urton 2014). Many of these methods involve image-making as a vehicle for obtaining an understanding of place rather than simply space: one of the foundations of sustainable landscape architecture and urban design. The traditional cartographic map provides a great deal of objective information about the land through the general arrangement and extent of graphic marks, gestures, and shapes. However, the understandings of the term “map” and the action of “mapping” are now developing beyond the concerns of accurate surveying and objective description of space. Maps created in ArcGIS, for example, can be transformed into “story maps” with text and images created by visitors and observers (or readers) that are redolent of the place. Unlike traditional mapping, the information conveyed in a story map may not be objectively correct or universal; the narrative can convey personal reflection and report perceptual as much as tangible patterns, cleaving more closely to how people sense the phenomena of the world around them (Bell 2012). Anne Whiston Spirn (1998) argues that in order to grasp meaning through the ecological, infrastructural, and social conditions of place, designers need to be capable of reading subtleties and variation in landscape conditions, regardless of urban, rural, agricultural, or other contexts. Similarly, Elizabeth Meyer (2005) notes a shift among environmental designers toward site readings and first-hand interpretations of place as primary sources for design inspiration. In particular, drawing in-situ allows the site reader to better commit what is being sensed and observed to memory and access tacit emotions (Crowe and Laseau 1984; Graves 2012). When created on-site, especially during the initial exposure to a place, these drawings have the potential to capture an evocative spirit of place. Initial forays into a landscape can provoke uniquely insightful and impactful impressions on the reader, and this period of “landing” (Girot 2009) can be especially powerful in stirring the reader’s sense of creativity (Riedelsheimer 2001; Von Seggern et al. 2008) and curiosity (Bell 2012). Privileging observation and presence rather than craft and accuracy, site drawings can be impressionistic and abstract (Graves 2012). Still, they are very much grounded in a direct understanding of place based on the senses and being present in the landscape. While intuitive drawings from on-site impressions capture abstract qualities of place, other forms of image-making explore hidden and equally important characteristics. Before becoming the objects of planners and designers, all sites are first places: imbued with complex individual and collective narratives (Beauregard 2005). The stories and perspectives aggregated through time are difficult or impossible to observe directly, and therefore require a more distanced research approach: through interviews, community engagement, archival research, or ethnographic study. Placing an emphasis on representation as a method of knowledge-building, Andrea Kahn (2005) asserts that drawings can create new forms of place understanding by capturing a designer’s unfolding thoughts and hypotheses. Thus drawings become the staging ground for designers to cope with complex and numerous realities, yet capturing the complexity of a place through a single image is nearly impossible. Past events and narratives, suppressed narratives and subcultures, and change through time all require relational exploration. Collage-like compositions, known as eidetic photomontage, provide a creative image-making method to examine the complexities and nuances of a place (Belanger and Urton 2014). Although creating collage risks a “candy store” aesthetic (Dee 2010), it also has the “power to summon feelings that span the fertile territory between art and life” (Iliescu 2008). Map features, image fragments, sketches, text, and other graphic elements brought together into eidetic photomontage allow for a generative process of exploration and discovery. Such compositions avoid “immediacy and reduction,” and serve as a vehicle for further understanding and ideation (Corner 1999a, 166). Although some skeptics bemoan a lack of spatial data and “correctness” to conceptual collage, the creative map-collages presented by James Corner and Alex McClean (1996) demonstrate how geospatial attributes can be juxtaposed with narrative complexity. Citing various land artists and Guy Debord’s Parisian dérive, Corner (1999b) expands upon the potential for mapping as a speculative placemaking method through interpretive place investigation and documentation through first-hand experiences. For a place to be resilient – to retain its basic function and structure despite disturbances (Walker and Salt 2006) – it requires the ongoing qualities that support human needs, values, and concerns. A resilient place must also have a healthy environmental capacity, so these needs must be held in balance with other ecological concerns. This central tenet of sustainable development has been well established for decades, and has stimulated a great deal of interest in healthy human/environment relationships, such as the inculcation of a land ethic (Leopold 1949); nourishing cultural difference and biological diversity (Hough 1990); and a sense of wonder and observational ecology (Carlson 1962). Martin Heidegger’s (1971) notion of dwelling – building and cherishing the land – evokes similarly deep relationships between people and place. If we turn to Maslow’s hierarchy of human needs, a resilient place must provide not only food and shelter, but also higher human needs such as self expression and self actualization (Maslow 1954). Despite challenges in measuring aesthetic delight in the evaluation of sustainability in development (Smith et al. 2007), Elizabeth Meyer (2008) convincingly argues that beauty should be included as a primary consideration for a sustainable environment, and that the “performance of appearance” is equally important to other more commonly cited (and measurable) dimensions of sustainability. Without the care of a collective group of people, cultural investment, and stewardship in a variety of forms, how can any inhabited place remain resilient to disturbance? Impossible. Placemakers must capture the imagination of people who will occupy and steward a site in order for it to remain resilient. This begins with understanding and documenting specific obvious and underlying environmental and social qualities of a place to inform design decisions. Design and planning professionals, tasked with making sustainable decisions about how the world changes (or does not change), may opt to use established techniques for understanding communities and the places in which they dwell. Creating resilient places begins and relies upon drawing the unseeable, intangible, and complexly layered qualities of place. In these readings, place is differentiated from space, and framed as a vital ingredient in environmental design. These readings explore ways of bringing narrative and experiential qualities to the representation and understanding of existing places. These readings propose ways to represent explorations of the complexities and potential trajectories of place. These readings consider healthy relationships between people and place, and the potential contribution of drawing to strengthen this connection. These student works demonstrate how the principles and methodologies above can be used in practice. These charcoal drawings by landscape architecture students Hannah Moll and Cameron Bayles represent the initial impressions of the spatial realities and perceptual qualities of an urbanizing site made during a phase of drawing, landing, and grounding. Landscape architecture master’s student Jonathan Knight explores complex place narratives through eidetic photomontage in the early stages of his research. Through montaging maps, photos of the site, and other images, he reveals global impacts associated with the Athabasca Oil Sands.